Clicking it launches a popup window that makes it easy for Laughing Squid readers to share posts on various social networks and bookmarking services like Digg, StumbleUpon, del.icio.us, Facebook, Technorati, Reddit, Tailrank, Ma.gnolia and others or to send directly to people via email, AIM, SMS, MySpace and Facebook. Also the ShareThis icon is an nice green, so it perfectly matches our design. 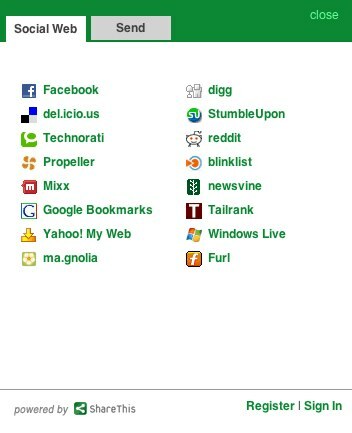 For more on ShareThis, check out Eric Eldon’s recent post on VentureBeat.